Home » Posts tagged with "milk"
The dairy industry recently launched #Februdairy, a social media campaign aiming to promote dairy milk during the month of February. But before the campaign could even officially start, it quickly became a marketing failure. 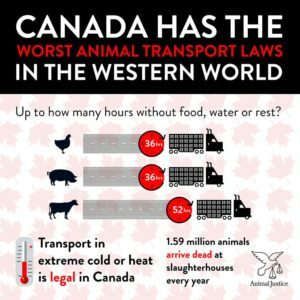 In the Canadian dairy industry, cows are forcefully impregnated, and and their calves are taken away shortly after birth so the milk can be sold. Male calves typically become veal, and female calves suffer the same fate as their mothers. When their bodies wear out and they cease to be profitable, dairy cows are sent to slaughter and become hamburger meat. Dairy milk is isn’t just bad for animals. It’s linked to multiple diseases in humans, and takes a toll on the environment. Additionally, up to 90% of people of some non-European ethnicities can’t even digest the lactose found in dairy milk. As plant milk sales continue to soar and dairy sales plummet, it’s easy to see why the dairy industry is desperate to convince people that its products are worth consuming. According to Statistics Canada, milk consumption has fallen by 21.5% per-capita since 2009. Meanwhile almond milk consumption has tripled in just two years, according to Nielson. Many milk companies see the writing on the wall, and are choosing to move into the plant-based milk market. Last year, Danone bought WhiteWave Foods, a plant-based milk company, for $10 billion USD. In 2017, Ben and Jerry’s started to roll out its impressive line of vegan ice cream. Meanwhile, Canadian health and food policy also appears to be shifting away from dairy. Health Canada recently released the draft for the new Canada Food Guide. Unlike previous versions, there is no dairy category in sight. But the real myths are the ones being told by the dairy industry. With the dairy-free movement continuing to grow, this spells good news for people, the planet and the cows. TORONTO—Last week, St. Michael’s Hospital announced a study claiming that children who drink non-cow’s milk are shorter than children who drink cow’s milk, generating international headlines. Now, concerns are being raised about the integrity of the study and the honesty of its lead researcher. In reality, in recent years, Maguire has received $90,000 from the Dairy Farmers of Canada and an undisclosed amount from the Dairy Farmers of Ontario, among other documented financial ties. The milk-height study itself was a project of TARGet Kids, which lists Dairy Farmers of Ontario and the Danone Institute as funders. Maguire also denied having been involved with any dairy industry advisory committees. In reality, in 2016 he sat on the Dairy Farmers of Canada Expert Scientific Advisory Committee. Now, Animal Justice is calling on St. Michael’s Hospital to stop accepting funding from industry lobbyists to maintain integrity in scientific research. Previously, Maguire published dairy-industry-sponsored research concluding that children should drink two cups of milk each day to obtain adequate vitamin D. But vitamin D is not even naturally occurring in milk and is added as a supplement. The College of Physicians and Surgeons of Ontario states that “Physicians must not knowingly be involved in concealing research results or presenting them in a misleading fashion.” As a research institution, St. Michael’s must take this obligation seriously. Previously, Animal Justice has filed complaints with federal regulators over Dairy Farmers of Canada advertisements disguised to look like public health announcements. Animal Justice has also exposed the federal government for funding research to actively seek out health benefits of dairy. For a detailed scientific critique of the study, please see here.